Hermit crabs aren't just fascinating to watch, they're an excellent teaching tool. They help a child develop routine and responsibility. Nevertheless, final responsibility for a hermit crab's care falls on the child's parents. Young children need help setting up a habitat, but letting them get involved in the process and conduct chores helps them understand their pet's habits and needs. Children between the ages of 5 and 10 are ready to for a hermit crab, but they need supervision. Watch them when they handle their hermit crab and do the daily care of feeding, filling water bowls and misting the sand. Encourage good hygiene by asking your child to wash his hands thoroughly after handling his pet. Wipe down the surfaces with a disinfectant wipe when playtime is over. Children over the age of 10 are generally responsible enough to manage on their own, but it's a good idea to check that the animal has clean water and food occasionally. Hermit crabs are social creatures that feed together and interact with each other in the wild, so you should plant to keep at least two of them. A 10-gallon aquarium makes a fine home for six small or three large hermit crabs. Plastic boxes sold as hermit crab habitats are too small for more than one, and one may become sick from the stress of living alone. Cover the bottom of the aquarium with a 3-inch layer of sand. A hermit crab needs two shallow water bowls with sponges in them, one for freshwater and the other for water with a pinch of aquarium salt. He also needs some pieces of wood to climb and a few extra shells with holes a little larger than the one he is using now. Top the aquarium with a wire mesh screen lid. Hermit crabs prefer temperatures between 78 and 83 degrees Fahrenheit, and they need a warm and cool area in the aquarium. Tape a small heat mat to the bottom of the aquarium at one end and keep it plugged in and turned on. Hermit crabs need humidity no lower than 70 percent, and the higher the better. The two dishes of water and warm temperature inside the aquarium help keep the humidity high, and it helps to mist the sand with a water bottle every day. A commercial hermit crab diet meets most of the animal's nutritional needs. He can also eat fresh vegetables, non-citrus fruit, cracker crumbs. Tuna and peanut butter give him an extra boost of protein. Leftover food spoils in the warm, moist environment of the aquarium, so don't heap the bowl with food. Remove leftover food and clean the dish every day. Every child wants to handle his pet now and then. Hermit crabs with entry holes in their shell less than an inch in diameter aren't mature enough to deliver a noticeable pinch. You can safely place them in the flat palm of a child's hand. 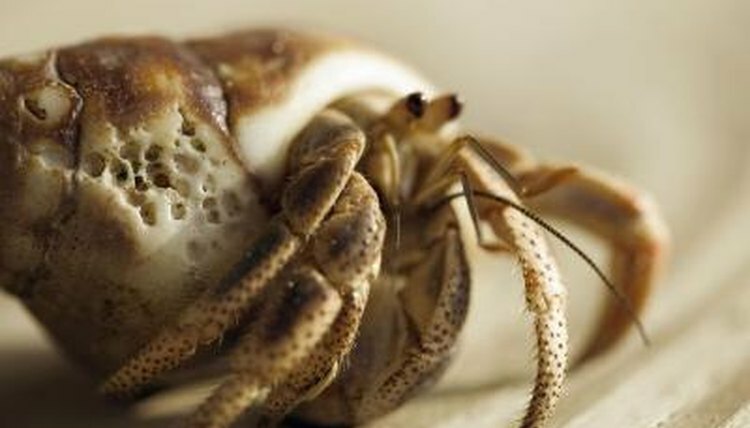 Handle larger crabs by lifting the shell between the thumb and forefinger. Hermit crabs climb and explore their environment by grabbing the things around them with their pincers. When they give you a pinch, they probably don't mean any offense. What Are the Tiny Holes in a Reptile Egg Used For?